MPA Pie Fuel is a complex carbohydrate powder designed to be used as the perfect adjunct to a high protein food meal or protein powder. This is not your typical fast-acting, insulin surging, simple carb formula like Karbolyn, Vitargo, dextrose, maltodextrin, and other fast digesting glucose polymers. 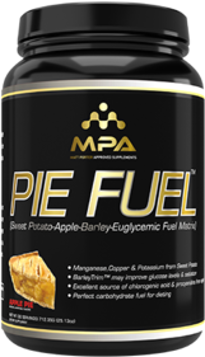 What I personally find advantageous about Pie Fuel is that it TASTES AWESOME!. For extreme dieter’s on their plight to get extremely lean, hunger pangs are signaling your brain non-stop — PIE FUEL IS YOUR SAVIOR. As always – I am bringing you products and ingredients I personally test out, use, and believe in, so my passion and enthusiasm is always sky high with each product.